Even though its the middle of Winter I still have the urge to pack up the picnic basket and head outside for a meal of complete relaxation and deliciousness. Instead of packing salads full of fresh ingredients i tend to make salads with roasted vegetables and warming spices. So even if we are freezing on the outside, at least our bellies are warm. 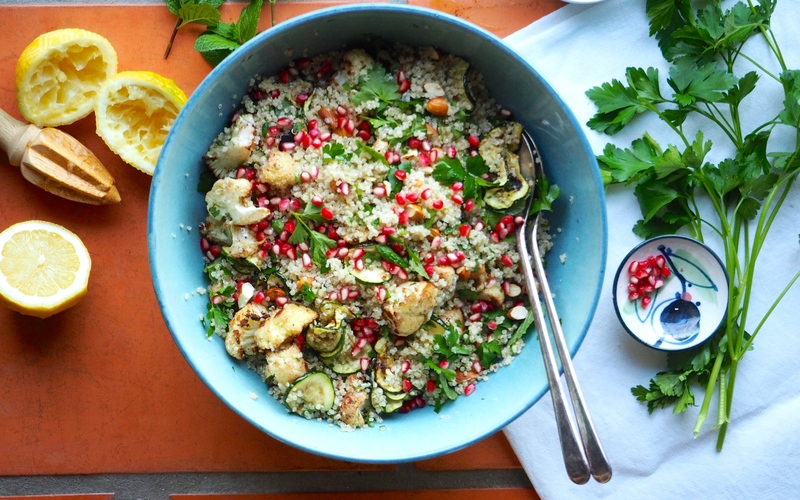 This is one of those salad’s, made with spiced roasted cauliflower, grilled zucchini and lovely fragrant quinoa to make it a little more substantial. Its perfect for a picnic but also a casual lunch or a side for dinner. Pre heat the oven to 180 degrees celsius. Slice the florets off the trunk of the cauliflower, reserving the stem for soup. Pop them in a bowl along with the cinnamon, cumin, olive oil and freshly ground salt and pepper. Toss to evenly coat then place on a baking tray lined with baking paper in one even layer. Place into the preheated oven and roast for 20 – 25 minutes. They should be starting the crisp up on the edges when you take them out. Set aside. Place the almonds on a small tray and roast in the oven for 5-10 minutes. Take out and roughly chop. Set aside. Meanwhile, thinly slice the zucchini and place in a bowl with the olive oil and freshly ground salt and pepper. Toss to coat all slices evenly. Place the slices in a single layer on a baking tray and grill at a high temperature for 8 minutes. Turning once half way through. Set aside. Wash the quinoa thoroughly and place in a saucepan with the water and bay leaf. Bring to the boil, turn down to very low and cook for 15 minutes. Leave the lid on for another 5 minutes before fluffing the quinoa with a fork. Once cooled slightly place it into a salad bowl. 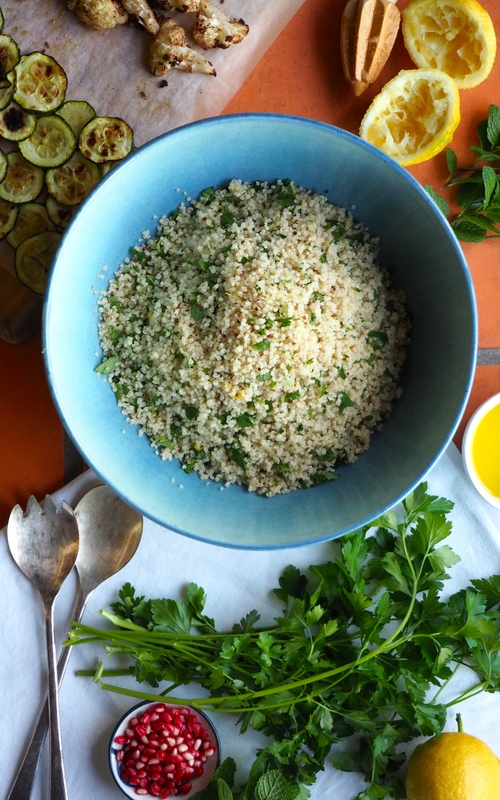 Finely chop half the parsley and mint and add this to the quinoa. Zest one of the lemons and juice both before adding to the quinoa mix. Now top with the roasted cauliflower, grilled zucchini and roasted almonds. 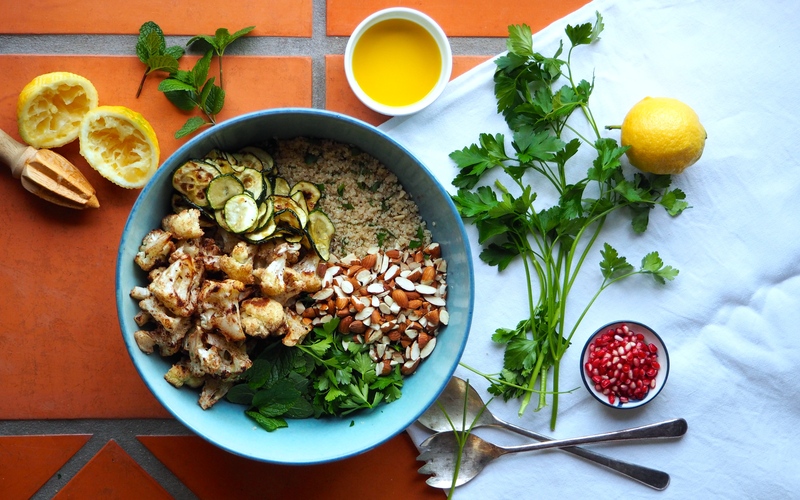 Pull the leaves off mint and parsley from the stems and add this to the bowl along with the pomegranate. Drizzle over a little more olive oil and pack up for a picnic or eat straight away.